There are many animals that are in danger of extinction in Kochi. The Japanese dormouse is one of such animals. This animal has a relation with people from long time ago for example it was thought by old people “guardian deity of forest” because there is a case that Japanese dormouses are hibernating in tree’s hole. Moreover, they do hibernation at place where people live: futon, chest of drawers and so on. Scientific name of Japanese dormouse is “Glirulus japonicus” It belongs to Glirulus. It includes only Japanese dormouse. Glirulus is part of Gliridae that have 6 other Glirulus: Dryomys, Eliomys, Glis, Graphiurus, Muscardinus, Myomimus, and Selevinia. Japanese dormouse lives by making nest in wasp’s old nest or rock’s crevice and on the broadleaf tree or on the rock of forest only in Japan. In Kochi, they live at the source of Shimanto river. In addition, they are seen in Kochi city, Tosa district and Takaoka district and so on, each place in Kochi. When the temperature drops to 12~14℃ they start hibernation under the ground, fallen leaves, tree’s hole, and futon in the people’s cabin. They eat many kinds of things for example insects, bird’s eggs, fruits, leaf buds, seeds and so on. Japanese dormouse’s usually weights 14~23g, but Japanese dormouse which is before hibernation is about 40g weight because it eats so much to save energy. The body is 6.8~8.4cm long, and the tail is 4.4~5.4cm long whose hair is fall out when it is caught. Its whole body is covered with brown hair and back has black stripe, but abdomen’s area is covered with white brown hair. A around eyes area is covered with black hair. They live about 3 years in the wild, while in breeding live 8 years. Japanese dormouse may face extinction because its number is decreasing by loss of habitat. So since 1975, Japanese dormouse had been registered with a precious natural treasure. Besides, it has been registered with Red Data Book (RDB). But each rank of RDB are deferent: IUCN’s rank is “Least Concern(LC)” whereas Japan ministry environment use different RDB criterion from IUCN’s one and Japanese dormouse’s rank at Japan ministry environment’s RDB is “Near Threatened(NT)” And Kochi’s rank is “Vulnerable(VU)” that is more danger than NT. It knew for the first time that it was a kind of the animal that the dormouse is on the edge of extinction. To defend biodiversity, the animal with a small body like them thinks that it should protect it protect it difficult. It is thought that it is a first step to protection to make a livable environment for them. Kochi Prefecture has a lot of ratios of the forest to land. However, we still think that we should think about remedial measures besides in case of being on the edge of extinction. Japanese dormouse is so cute. 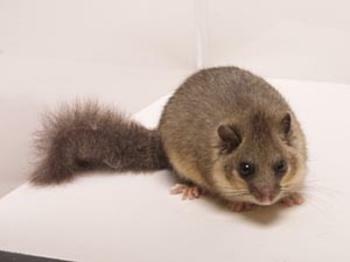 I surprised to know that the waight of Japanese dormouse bouble for hibernation! The dormouse is one in an animal very favorite of me. It was surprised for living for as many as eight years when artificially promoting it. I want to see the dormouse under hibernation in the chest of drawers. It have been living by humans but it is in danger of dying out. In spite of people call “guardian deity of forest” ,I think the phenomenon is caused by humans. I think Japanese dormouses should pretected by japanese because they destroyed its habitat. I think a Japanese dormouse to be very pretty. If it was not an endangered species, I wanted to keep it.